Go to original pattern for design DROPS 63-16. DROPS Circular needle and double pointed needles size 3.5 mm and 4.5 mm. Knitting tension: Remember needle size is only a guide! 20 stitches x 26 rows with needle size 4.5 mm and stocking stitch = 10 x 10 cm. Ridge/Garter stitch: 1 ridge = 2 rounds. Knit 1 round and purl 1 round. Rib: * K2, P2 *. Repeat from *-*. Body: Cast on 180-200 stitches with circular needle size 3.5 mm and dark grey and work 2 ridges. Change to circular needle size 4.5 mm and work M.1 at the same time as, on round 2 marked with *, you increase 10 stitches evenly spaced on round = 200-220 stitches. Remember the knitting tension. When piece measures 18-19 cm work M.2 - make sure you have 1 llama mid front of front piece. 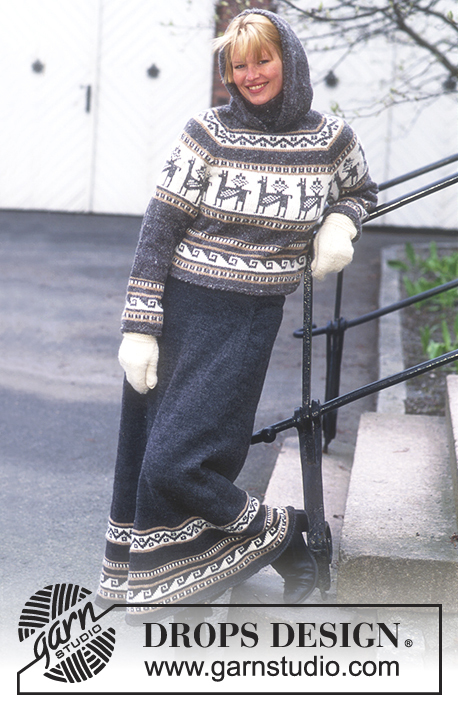 At the same time when piece measures 27-30 cm work next round as follows: Cast off 3 stitches for armhole, 94-104 stitches front piece, cast off 6 stitches for armhole, 94-104 stitches back piece, cast off 3 stitches for armhole. Front and back pieces finished separately. Back piece: = 94-104 stitches. Continue to decrease for armholes inside 1 edge stitch (worked in garter stitch) every 2nd row: 1 stitch x 25-31, then every 4th row: 1 stitch x 3-0. At the same time when there are 1-2 decreases left, cast off the middle 30-32 stitches for neck, continue to cast off for neck on next row: 2 stitches x 1. After M.2 work 9-14 rounds with dark grey. Piece measures approx. 51-54 cm, cast off. Front piece: Decrease for armholes and work pattern as for back piece but when you have 2-4 decreases left, cast off the middle 26-28 stitches for neck, then decrease for neck every 2nd row: 2 stitches x 2. After the last decrease piece measures approx. 51-54 cm. Cast off. Sleeve: Cast on 50-50 stitches with double pointed needles size 3.5 mm and dark grey and work 2 ridges, then change to double pointed needles size 4.5 mm and work M.1. At the same time, when piece measures 8-8 cm increase mid under sleeve: 2 stitches x 23-23 for S/M: Alternately every 3rd and 4th round, M/L: Every 4th round = 96-96 stitches. When piece measures 35-35 cm work M.2 - place 1 llama mid top of sleeve. When piece measures 44-46 cm cast off 6 stitches mid under sleeve (make sure it is the same round in pattern M.2 as on body) and piece is finished working back and forth on needle. Continue to decrease in each side inside the 1 edge stitch (which is worked in garter stitch) every 2nd row: 2 stitches x 7-7, 1 stitch x 24-24 = 14-14 stitches. After M.2 continue working with dark grey until piece measures 68-70 cm. Cast off. Assembly: Sew raglan seams - you have 1 edge stitch for seams on all parts, make sure the pattern borders meet each other! Neck: Knit up approx. 76 stitches around neck with double pointed needles size 3.5 mm and work rib for 12 cm. Cast off elastically. Hood with tassel: Knit up and work hood on outside of high collar. 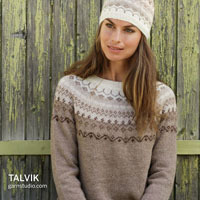 Knit up 94-94 stitches on the pick-up round for the high neck with circular needles size 3.5 mm and dark grey. Work back and forth from mid front as follows: 1 cm rib but with 2 stitches garter stitch in each side towards mid front. Change to needle size 4.5 mm at the same time as you increase 12-12 stitches evenly spaced on first row = 106-106 stitches. Then work stocking stitch with 2 stitches garter stitch in each side towards mid front. When hood measures 36-37 cm place stitches on a thread, lay hood double and graft together with grafting stitches mid top of head. Make a tassel as follows: Cut 50 strands (of approx. 20 cm) with dark grey, tie a double strand (of approx. 20 cm) around middle of tassel, fold it double (= tassel is now 10 cm long), wind a strand 4-5 times around tassel approx. 3 cm below fold. Fasten tassel at back of hood. Crochet edge: Work around bottom of body, bottom of sleeves and around hood from right side with double yarn and dark grey with crochet hook size 4 mm as follows: Work a row of double crochets in opposite direction, i.e. from left to right without turning piece. DROPS Circular needle size 4 mm. DROPS Crochet hook size 4 mm. Knitting tension: Remember needle size is only a guide! 21 stitches x 28 rows with Knitting tension: Remember needle size is only a guide! 21 stitches X 28 rows with needle size 4 mm and stocking stitch = 10 x 10 cm. Skirt: The skirt is worked bottom up. Cast on 330-390 stitches with circular needle size 4 mm and anthracite and work 2 ridges. Continue by working M.1 and M.3 and then continue with anthracite. At the same time, when piece measures 24-23 cm insert 3 marker threads in piece with 110-130 stitches between each. 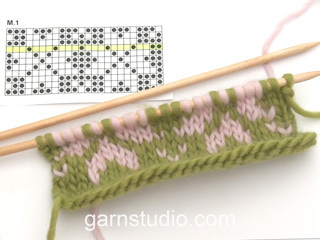 Decrease on each side of the marker threads (= 6 stitches less per round) before the thread as follows: Knit 2 together. After thread as follows: Slip 1 stitch, K1, pass slipped stitch over. Decrease a total of 10-18 times every 5-3 cm. Then decrease on each side of the marker threads: 1 stitch x 17-17 every cm = 168-180 stitches. When piece measures 93-97 cm decrease 22-20 stitches evenly on round = 146-160 stitches. 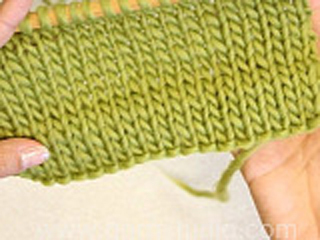 Work 3 cm stocking stitch, purl 1 round (=folding edge), 3 cm stocking stitch, cast off and fold the edge double towards the wrong side and sew down. Thread elastic through the folded edge in the waist. Crochet around bottom of skirt with double yarn from the right side and anthracite with hook size 4 mm as follows: Work a row of double crochets in the opposite direction, i.e. from left to right without turning piece. 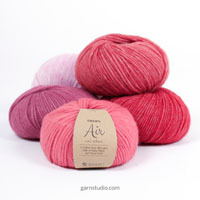 Materials: Alaska, 100% pure new wool, 50 g = approx. 75 m.
DROPS Circular needle size 4 mm. 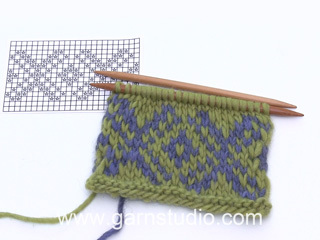 Knitting tension: 19 stitches x 25 p = 10 x 10 cm with needle size 4 mm and stocking stitch. Remember needle size is only a guide! 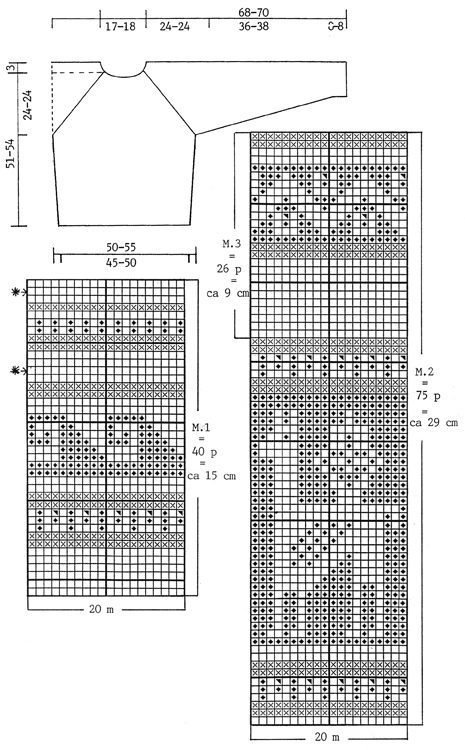 M.4: * 2 rounds stocking stitch, purl 1 round *. Mittens: The numbers in () = men’s size. Cast on 42 (48) stitches with circular needle size 4 mm and off white and work garter stitch for 3 cm. On next round decrease 4 stitches evenly on round = 38 (44) stitches. Continue by working M.4 for 5 cm. After M.4 insert 3 marker threads as follows: 1 marker thread, 1 thumb stitch (stocking stitch), 1 marker thread (= i the side), 22 (25) stitches on top of hand, 1 marker thread (= in the side), 15 (18) stitches in palm. Continue with stocking stitch - the piece is now measured from here. When piece measures 1 cm increase on each side of the thumb stitch every 2nd round: 1 stitch x 5 = 48 (54) stitches. When piece measures 6.5 (7) cm place the 11 (11) stitches over the thumb on a thread. Then on next round cast on 1 stitch over stitches on thread = 38 (44) stitches. When piece measures 15 (16) cm move the marker threads in each side 2 stitches up onto hand (= 1 marker thread in each side). 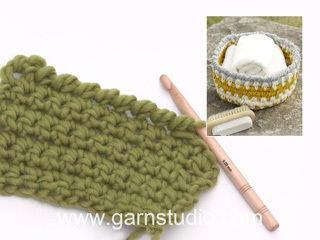 Then decrease as follows before the marker threads: Slip 1 stitch, knit 1, pass slipped stitch over the knitted stitch. Decrease as follows after marker threads: Knit 1, knit 2 together. Decrease in each side a total of 2 (3) times every 2nd round and then every round until there are 6 (4) stitches left on needle. Pull a double strand through the remaining stitches, tighten and fasten well. Mitten measures approx. 27 (29) cm. Thumb: Knit up 15 (18) stitches around the thumb and work stocking stitch. After 6.5 (7) cm knit the stitches together 2 and 2 on next round, pull the thread through the remaining stitches, tighten and fasten well. Work another mitten.